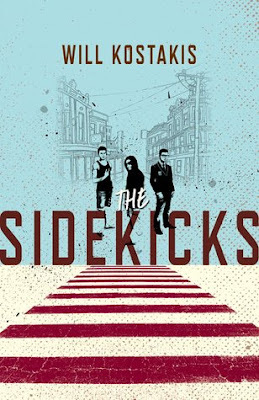 Award winning author Will Kostakis delivers in spades with his third novel for young adults. The Sidekicks explores the inner thoughts and turmoil of three very different teenage boys after their best friend Isaac suddenly dies. Ryan, the swimmer, Harley, the rebel and Miles, the nerd, struggle to find meaning in an existence without Isaac. Although they were all friends with Isaac, they were not good friends with each other and have nothing in common apart form Isaac. Told in three separate and unique narrative voices, Kostakis manages to capture the distinct essence, vulnerability and personality of the teen boys. In the days following Isaac'e death, the reader goes on a journey into each boy's life, flashbacks and what Isaac meant to them. Before Isaac died, they were his sidekicks, afterwards, their lives are irrevocably changed and Isaac's death leads to surprising outcomes as each boy reveals something Isaac knew about them. Where they had mainly separate dealings with Isaac before he died, afterwards they are thrown together in different situations and learn more about each other. In various ways, their grief over Isaac somehow binds them. Set in a Sydney boys' high school in contemporary times, Kostakis captures life at school, teen angst and hijinks and realistic student-teacher dynamics. Kostakis beautifully captures the voice of each character and the pain, humour and challenge of being a teenage boy. Themes of relationships, family, drugs and alcohol, grief, LGBTI issues and school life are featured. Kostakis also uses various narrative techniques to move the story along, keeping it fresh and engaging such as flashbacks, mobile text message bubbles and screenwriting headings, which will appeal to teen readers. Numerous great one-liners and funny moments add a light touch to the story. This book will resonate equally to male and female readers and will not disappoint. Highly recommended.